There is a longstanding Sundance tradition of addiction dramas (James Ponsoldt’s Smashed, Debra Granik’s Down to the Bone, Laurie Collyer’s Sherrybaby, just to name a few). The best addiction films focus on the relationships ruined or jeopardized by the addiction, showing the hero’s struggle and the loved ones who are impotent to stop the self-destruction (see: The Man With The Golden Arm). The worst ones, like Requiem for a Dream or Trainspotting, glorify the act of getting high or romanticize the milieu and lifestyle. Based on a memoir by Amy Jo Albany, Low Down is firmly set in the space of functional addiction; it neither glorifies the act nor demonizes it, while at the same time dramatizing the price it takes on a father-daughter relationship. John Hawkes plays Joe Albany, a talented but underemployed jazz pianist. His teenage daughter Amy (Elle Fanning) lives with him in a one-room flophouse hotel in downtown LA. Set in the early to mid-‘70s, Low Down is structured around Amy’s experience growing up devoted to a loving father who also has an unconquerable addiction to smack. Despite their serious cash problems and Joe’s constant hanging out with other drug-using jazz players (most notably Flea doing a great Bill Evans), Amy cherishes every moment spent together with her father. When he misses a parole meeting and gets caught using yet again, Joe must return to jail while Amy returns to her grandmother’s tiny-but-homey one room apartment. Glenn Close plays the tough-yet-cultured-and-supportive grandmother and is Elle’s one stable adult in her tumultuous life. Our heart breaks for Amy every time her father lets her down, yet he is so endearing and so dedicated to trying to make life work for her that despite his addiction we never hate him. Low Down might very well be the most sympathetic, tender, and loving heroin-addicts-in-an-LA-flophouse drama ever committed to celluloid. Speaking of celluloid, Low Down was shot on actual film (16mm) by Chris Blauvelt, who won Sundance’s Best Cinematography award for his efforts. The film has an authentic period feel that is the exact opposite of most contemporary period pieces, which tend to over-fetishize the period details. Films that were actually shot in the ’70s had a more practical attitude toward costumes and hair, and that is the reason why current films trying to capture this period often feel less authentic. In reality, the ‘70s had a primarily brown ochre color palette—flashy neon clothes were the exception, not the norm. 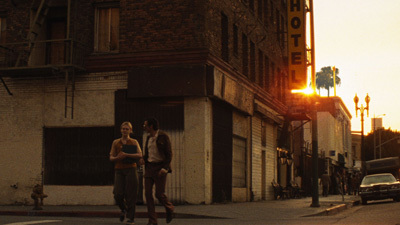 Due to this sensitive approach to the film’s look and the evocative use of film stock, Low Down often feels like an actual 1970s movie (see: Fat City). The celluloid format is best able to capture the painful glare of sunlight jabbing through the cracks in the curtains after a long night spent carousing. Meanwhile, it also happens to be the best format to capture true darkness. One scene, in which Amy is trying to sleep while her father and drunkard mother tussle in the nearby bed, contains moments that reminded me what darkness on screen is supposed to feel like. These days, there is almost no darkness that a digital camera can’t penetrate, and though there are often great benefits to shooting in hypersensitive digital, in reality film stock still is the only format that can actually convey the reality of how we often experience broad ranges of light exposure. It’s no coincidence that my two favorite films at this year’s Sundance, Low Down and Listen Up Philip, were both shot on film. Director Jeff Priess has a long past DPing documentaries—most notably the Bruce Weber directed Let’s Get Lost—but Low Down is no standard observational naturalism. It embraces a quite complex narrative perspective. Though we are most often seeing the world through Amy’s eyes, the film is shot with a point-of-view that transcends her present-tense perspective. There are many scenes in which Amy is not present and we are firmly within Joe’s world; likewise, there is a lot of dramatic irony in which we recognize the reality of the situation even though Amy doesn’t fully understand what is going on. In this way, as a biopic, Preiss’ film is quite interesting in how it rather seamlessly respects the subject’s current lack of perspective while also depicting the reality of the father’s struggle. It’s as if the narrative point-of-view is simultaneously restricted and ominous. In the end, the only way I could explain this dichotomy is that Amy Jo’s actual love and empathy for her younger self and her father is so all encompassing that these things can exist simultaneously. In the end, Low Down lives in both the immediate ‘70s period and in the distant future of the adult Amy’s reflective perspective. It is a testament to Priess’ command of camera placement that this complex narrative perspective serves to increase the dramatic velocity of the story rather than impede it. The result is a rich portrait of a very dysfunctional but loving family rendered with a technical skill that far surpasses most films that have trafficked in this milieu. Low Down is a new high point in the addiction/drug drama genre because it is a story that shows how love can transcend the addiction—at least for a while.